A striking 14kt custom made white gold mill grain ring with 1 oval cabochon floral translucent and frosted rock crystal, approx. 16.0 x 11.8mm; 1 square cut medium intense blue aquamarine, est. 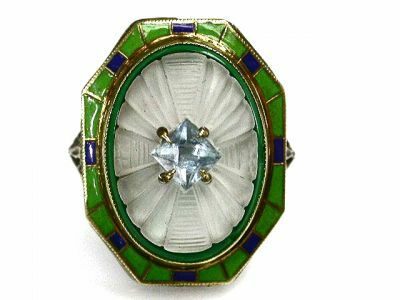 0.34ct and the ring has light powdery yellowish green and small blue enamel panels around a green onyx frame.